Star Trek: Voyager is the fourth series in the Star Trek franchise. It was made at the Paramount Studios from 1994 to 2001. The show followed directly on from The Next Generation, but was located in the Delta Quadrant. This gave it a different feel from that series in that there was no contact with Starfleet or the Federation. .The journey home meant there was little scope for any meaningful on-going alien development until the Borg were brought in from season four. It ran alongside the very popular Deep Space Nine for five years, and was very much a child of the internet age, with the Star Trek website up and running at the same time. 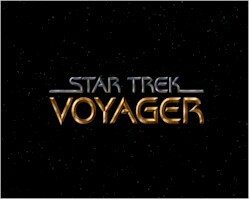 With the instant feedback and criticism that forums are famous for generating, Voyager became the most derided of the shows amongst the online fans until Enterprise. Season one was cut short and four episodes were held over to season two. It should have finished with Projections, Elogium, Twisted and then The 37's, which makes a lot more sense when viewed in that way. My everlasting gratitude to Paul Ruditis for writing the Star Trek Voyager Companion, an invaluable aid in the creating of these pages. In this section - Transcripts of the 7 seasons episodes. Examples of number 47 in the series. If you spot any I have missed, let me know. Tables of 'line count' for the main characters split into two sections - with Kes, and then with Seven of Nine. This was to address the accusation that when the Borg character was introduced, she took the lion's share of the stories. These pages use frames, which were the latest thing at the time. Sorry. This is a cookie free, advert free site and I hope to keep it that way. If you have found it useful and want to buy the typist a cup of tea and a slice of fruit cake for her efforts, thank you very much.